Yes, Jesus was one of the all-time nice guys of human history. He ended up on a cross. Leo “The Lip” Durocher is best remembered for “Nice guys finish last,” something he never really said. Of all the great players recruited to the old New York Yankees by Paul Krichell, baseball’s best talent scout of all time, Leo Durocher was the only one who ever thanked Krichell for believing in him and bringing him into professional baseball. Krichell traveled the land in search of players for the Yankees. Jesus traveled the land, preaching to believers and doing good things. In Luke 17, he comes to a village where ten lepers call to him from a distance, begging his mercy. He tells the whole crew to go and show themselves to the priests, and they all get cured of their disease. I don’t know a thing about Leo Durocher’s religion, but he must have heard that story and taken it to heart. “Scouting for the Yankees,” a wonderful profile of Krichell by W.C. Heinz, tells the story of Krichell’s fabled 37-year career. Between 1920 and 1957, he signed more than 200 baseball players. They included Lou Gehrig, Hank Greenberg, Phil Rizzuto, Tony Lazzeri, Whitey Ford – Hall of Famers all. He also went to see a minor league team play in Hartford one day. He’d seen the shortstop’s name on file in the Yankee’s head office, and he remembered the key observation: “Can’t hit.” But he saw something he liked, and he signed that shortstop anyway. It was a kid named Durocher. Leo went on to a Hall of Fame career too, as both a player and manager. He played shortstop for the Yankees’ Murderers’ Row and was captain of the Cardinals’ Gashouse Gang. As manager, he seemed to specialize in umpire-baiting tantrums and ejections from games. But he brought the Dodgers, “the Brooklyn Bums,” to their first pennant. Many years later, in his autobiography, Durocher recalled his assessment of that Giants team as “Take a look at them. All nice guys. They’ll finish last. Nice guys. Finish last.” Sportswriters and broadcasters massaged those words down through the years until they became “Nice guys finish last,” which Leo never actually stated. Durocher quickly changed the Giants and their losing ways. He was manager when they game from 13 and a half games out to win the 1951 pennant on Bobby Thomson’s home run. He managed the team to the World Series win over the Indians in 1954. He also managed the Cubs and Astros. In 24 years, he racked up 2008 wins. At the time of his retirement, he was the fifth winningest manager of all time. Just like the other nine. But not like Leo Durocher. In the book, the protagonist describes Durocher’s approach to his game: “Durocher was a symbol of what baseball – any game – is all about, the overwhelming desire to win.” He tells of an interview scene in a post-game locker room after Durocher’s Dodgers had blown the 1946 pennant race and ended up tied with the Cardinals after losing the last game of the season. As it turned out, the Cardinals won two straight games of a three-game tiebreaker playoff, eliminating the Dodgers. Even the great ones don’t win them all. I think Jesus would agree with that. 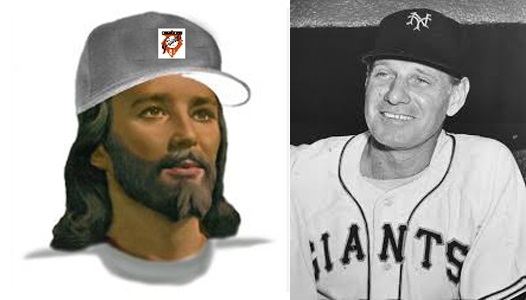 I also think that if they’d met up in Galilee two thousand years ago, Jesus would have bypassed Peter and given that set of keys to Leo Durocher instead. You are currently browsing the Veteranscribe's Blog blog archives for May, 2015.